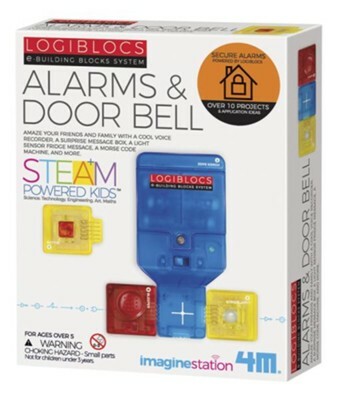 Build alarms and doorbells with this fun kit. Designed for ages 5 years and older, this kit features over 10 projects and applications such as Door Bell, Solar Alarm, Fridge Alarm, and many more. Includes 4 plug together blocks including POWER BASE, BUTTON, LIGHT SENSOR, BLEEPER and a detailed instruction booklet. I'm the author/artist and I want to review Alarms and Doorbell Kit.